from our mountains, our tundra—that way we had all the meat we might need. as cubes, cylinders, barely material puddles of admixtured horror and blood. Rembrandt knew of all this—isn’t his flayed beef carcass really a caveman? It’s Christ also, of course, but much more a troglodyte such as we no longer are. Myrmidon, Ottoman, Olmec, Huron, and Kush: gone, gone, and goodbye. aglow with the cruelties of crimson, the cooled, oblivious ivory of our innards. your heart howling its Cro-Magnon cries that compel to battles of riddance! where dare enter none but subservient breeze; bent, broken blossom; dry rain. Strangers on a Train Returns! Tonight 19:00! Join us on Tuesday, October 20 for the next installment of Strangers on a Train. All events are free to attend and are open to the public (19+ years). Fiddlehead taking entries for 2016 issue! 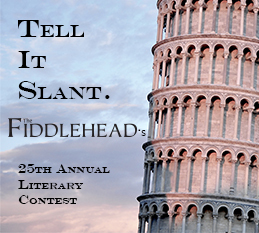 Tell It Slant: The Fiddlehead’s 25th Annual Contest. Get your entries ready! This year’s contest is now open! of The Fiddlehead (no. 267) and on our website. The winning authors will be paid for publication in addition to their prizes!